Recently, aspects of my life aligned so that I was able to fulfill a lifelong dream and visit fabled Easter Island in the southeastern Pacific. Although my primary purpose was to visit the myriad of archeological sites, view the hundreds of giant stone heads and get to know the inhabitants of this "most isolated community in the world," I could not possibly visit such an exotic location without testing its potential as a location for very long-range MW DXing. Since the nearest concentrations of MW broadcasters were on the west coast of South America, 2300 miles to the east and in New Zealand, 4300 miles to the southwest, there was every likelihood that Easter Island might be a prime DX location. Easter Island is a triangular volcanic island measuring about ten miles on a side. The 3300 inhabitants are concentrated in a single village, Hangaroa, on the southwest corner of the island, also the only location of an AC power grid. Since I knew that I would be 12 volt DXing from, at best, a rental car, and since I was quite concerned about luggage weight and security screening, my DXing equipment choices were both critical and limited. After a good deal of thought, I chose the marvelous Eton E1-XM as my primary receiver and the small Kaito KA1103 as back-up; the Eton E1-XM had recently supplanted my long cherished Sony 2010 as my favorite DXing portable. I was not disappointed in either receiver! In my many years of seaside DXing, I've never found an antenna that performed as well as a Beverage, so I selected two 500-foot wires as my antennas; weight and bulk concerns led me to adopt the Beverage-On-the-Ground (BOG) configuration and a very light 28-gage, Teflon-coated wire. I was concerned about the BOG configuration and using such tiny wire; again, I was not disappointed. My favorite full-size headphones, a magnificent new Edirol R-09 digital audio recorder and my trusty WRTH rounded-out the DX package. The distances involved in Pacific-based DXing are enormous. With the 2,400 mile width of the USA in mind, the distances from Easter Island to anywhere are simply staggering: it is 2300 miles to Chile, 4300 miles to New Zealand and 5300 miles to the nearest edge of Australia; most of the USA, including the Hawaiian Islands lays at about the distance of eastern Australia, 5300 miles. Beyond those "close-in" locations, distances get truly planetary: Western Europe and Japan are about 8500 miles away, while coastal China lays out at 9500; to go beyond that at MW frequencies is simply unthinkable. 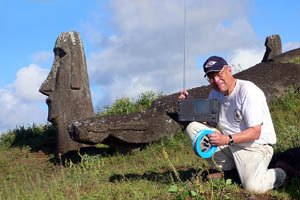 As I planned the DXpedition, I anticipated hearing quite a few coastal South American stations from my Easter Island QTH; I also expected to hear a decent number of New Zealand broadcasters, mixing with a few of the stronger Australians. I also eagerly anticipated hearing a number of stations from the island nations of the Pacific. Since friend and well-known South American DXer Rocco Cotroneo had recently heard several of the largest Japanese MW stations from the Chilean coast, I, too, hoped to hear the biggest of the NHK stations, from twice as far away as from my favorite haunts at Grayland, WA, USA. I planned my two-week stay on the Island to include four all-night DX sessions on the local Friday and Saturday nights, with one three-hour, early evening introductory session ahead of the first weekend and two similar sunset DX sessions during the intervening week. That schedule proved very workable and was followed closely. 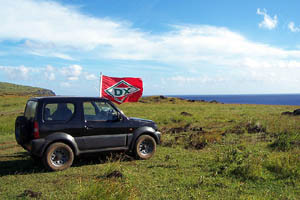 My DX shack turned out to be a small Japanese SUV, ruggedized and adapted to the rut and rock-strewn gullies that are laughably called "main roads" outside of Hangaroa village. My location on the island, except for the first familiarization session was near the Te Peu archeological site on the upper portion of the northwest shore. This was as far north of Hangaroa, about 6 miles, as the "road" ran; since none of the more popular archeological sites were nearby and the road was so poor, the site was about as isolated, both electrically and physically, as possible. The spot that I chose was on a plateau atop a 200 foot northwest-facing cliff, looking out across the broad Pacific into quite magnificent sunsets. I ran one antenna due west, unterminated, directly to the cliff, 480 feet away. That antenna was used, directly, for all Pacific DX and "over the shoulder" for South America. The second BOG ran due north, pointing at Central and North America. The DX during my first familiarization evening session was about what I expected: I started at 0039 UTC, almost an hour before local sunset and I found the MW dial covered with either carriers or audio from South America. The only surprise that evening was from how far north many of the signals were coming: my first logged station was Radio Programmas del Peru-730 kHz., Lima that as just booming in. That logging was closely followed by Radio Sanfrancisco-850 kHz. Guayaquil, Ecuador, practically off the side of my E-W beverage and booming in, as well. The rest of that evening followed suit. By sunset, there was what seemed to be South American audio on almost every channel from 540 to 1700 kHz. I logged a number of Argentine stations, especially above 1600 kHz., and what seemed to be every station on the air in either Lima or Guayaquil. Since there was already DX on the band when I turned on an hour before sunset, I decided to begin all other sessions at 0000 UTC, fully 90 minutes before sundown. So, I had antennas out and my set-up primed to go at 0000UTC on Saturday, March 17. 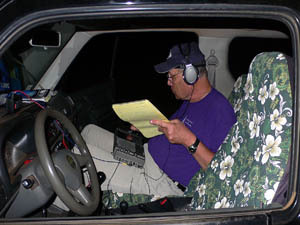 When I flipped the switch, I began the most surprising and thrilling DX session of my 53-year DX career. Fourteen non-stop hours later, I realized that I’d found the mother of all DX locations. In one night, I logged all continents, 22 countries and 122 stations... all but a few were IDed by station ID or by parallels. I managed to log 15 IDed Kiwi and Aussie stations in 45 minutes. I wasn't trying for a speed record, but since I'm not going to report for QSLs, all I had to do was positively ID them. The conditions were absolutely fabulous: in that one night, I logged from Egypt clear around to India (YES!). I logged 70 stations from Australia and New Zealand combined. The best receptions of that first full night were hearing my only Brazilian, Radio Tupi, 1280 kHz., in Rio, my first from Europe/Mid.East/N.Africa, Algeria's ENRS1-531 kHz., and hearing 1566, AIR Nagpur for 20 minutes, including a full EE ID and the 5 minute EE news that followed. I had no idea that the whole world would be open to me on medium wave, from isolated Easter Island! The remaining three all-night DX sessions followed very much the same pattern: Carriers from Europe, North Africa and the Middle East would appear about 90 minutes before local sunset, on the 9-kiloHertz spacing. There would also be a few "early bird" South American carriers or low audio about the same time. At 60 minutes before sunset, European, et al., signals audio would appear. Most of those signals would be only moderate level, but some of the Spanish and some of the Middle Eastern signals were startling in their strength. The really long-haul signals were pretty much done by the time the sun touched the horizon at 0130, but by then South Americans crowded the dial. By 0230, full dark, signals from eastern North America began to shoulder aside many of the South Americans. In the next two hours, the spotlight seemed to travel rather swiftly westward across the United States, with Cleveland and Charlotte being followed by Chicago and St. Louis and then by Denver, Salt Lake City and Albuquerque. By 0500, the spotlight had swung to the US West Coast, with the large majority of the stations being heard from central and southern parts of the state. Indeed, there was at least some California presence until dawn on Easter Island. For reasons that I don't begin to understand, the strongest (like a local!) station from California was 1530, kHz., KFBK, Sacramento which far out shown the more southerly stations, high band or low. By 0730 UTC, the New Zealand stations would begin to appear on the 9 kHz. channels, with the Aussies joining the mix by 0900 hours. Although a few Japanese appeared as early as 0830, they were most logged during the pre-local dawn 1200-1300 time span. One of the biggest surprises of the DXpedition was the absolute dominance of Chinese stations during the 30 minutes before and after the 1330 local sunrise on Easter Island. Chinese stations, LOTS of Chinese stations, travelled more than 9500 miles to populate the band during dawn enhancement! Things got so busy on the best Chinese dawn, March 24, that I was forced to choose between noting the presence of all of the Chinese signals on the band or taking the time to identify just a few and ignore the rest. Since the presence of so many extraordinarily long distance signals seemed more important than the exact identity of a few, for the first time in my life, I just IDed the language positively, noted "UNID CC station" and moved on. The loggings that follow reflect that unusual approach. Each of the all-night sessions closed out with one extra-ordinary signal lasting long after the other signals faded out... and long after dawn. The first of these began with me innocently listening to 1566, HLAZ, the super-power Christian broadcaster from South Korea. It often lasts long after dawn at our Grayland site and it was doing quite well 40 minutes after dawn on March 17th. Soon, I noticed something beneath HLAZ; as this second signal built, it certainly sounded like Hindi and I remembered that AIR Nagpur on 1566 had been heard by Patrick Martin on the Oregon Coast and was one of our "Holy Grail" targets at Grayland. As you already know, that signal did prove to be AIR Nagpur, over 11,700 miles away. The magical pre-sunset hour the following evening was highlighted by the first of several receptions of the U.S.-operated Radio Farda-1575 broadcasting to Iran from the United Arab Emirates, a distance of 11,400 miles. The reception was made even more memorable by the content of the pop music program: a Michael Jackson tune followed by some Rap music in Farsi. That must drive the Iranian authorities crazy; it sure does it for me! That second all-nighter was closed out with another extra-ordinary reception. Well after dawn (and time to try again for Nagpur on 1566) on my way up the dial, I noticed an unusual signal on 1413: it sounded (and was) Hindi and I was fascinated. Checking in the East Asia-Pacific section of WRTH, I could find no major station on 1413 that ought to be transmitting Hindi at that hour. The Hindi talk programming contained a few English words mixed in the conversation, not unusual in itself, and then there was one full interview in very British English. Wow! I kept listening, hoping for a station identification… and then I heard a website given out: it was something like "hindi.bbc.uk." A light bulb lit; 1413 is the MW frequency for the huge BBC Oman Relay Station! Sure enough, their schedule shows an hour of Hindi, beamed eastward to India (and directly at Easter Island) at the proper hour. Further listening on subsequent mornings proved beyond a doubt that I was hearing the Oman Relay Station, and well, from over 13,350 miles away. If you combine the reception of Radio Farda before sunset (11,400 miles) with the Oman reception of 13,350 miles, I was able to more than circle the globe in a single DX session, on medium wave. I never imagined that it would be possible and I feel extraordinarily privileged to have witnessed such. I would especially like to express my appreciation to numerous senior members of the MW DX community who helped me in the planning of this DXpedition and in identifying many of the stations listed below. With their help, so freely given, this experience would have been ever so much less enjoyable and productive. The final all-session count was 235 stations received in 40 countries, on all continents. However, as wonderful as the DX was, the scenery, the monuments, the archaeological sites almost without number and the extraordinarily friendly inhabitants of Easter Island were even more memorable. 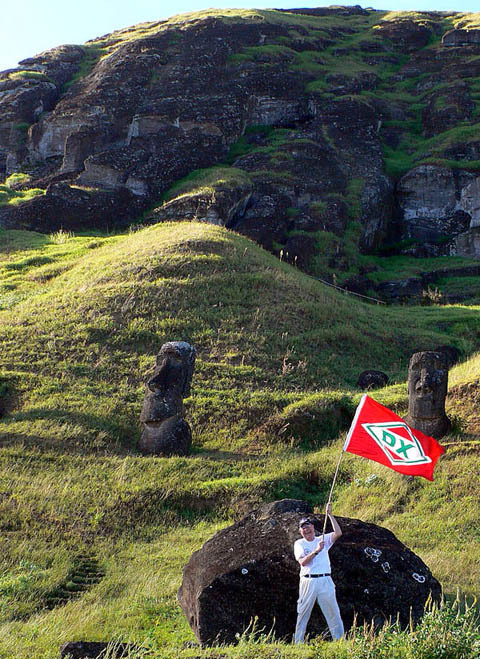 My visit to Easter Island was truly the most fun that I’ve ever had with my clothes on! 531 ALGERIA ENRS1, Ain El-Beida , Mar 17 0100 - Noted here several evenings before LSS. 567 EIRE RTE1, Tulamore, (t) , Mar 18 0157 - Poor level, EE pop and lounge songs, Female news reader after TOH fanfare. At least some of the words in EE. Tentative this was RTE 1 Tulamore, Eire. 585 SPAIN RNE1 Madrid , Mar 17 0105 - Heard each evening. 'Radio Nacional de Espana' //684 Sevilla. 612 BOSNIA-HERZGOVINA B-H Radio 1, Sarajevo(t) , Mar 17 0103 - Tentative this at good level in a mid-European language. 621 SPAIN RNE1 Synchros , Mar 22 0205 - Fair level. //684. 684 SPAIN RNE1, Sevilla , Mar 17 0101 - Heard nightly. Strongest Spanish station. //585//855. 711 SPAIN COPE, Murcia (pres.) , Mar 18 0103 - Presume this here with news and commentary in SS. 711 MOROCCO RTM, Laayoune (pres.) , Mar 21 2231 - Traditional Arabic music and talk. Fair/good. 738 SPAIN RNE1 Barcelona , Mar 18 0104 - Fair level //585 & 684. 747 SPAIN RNE5 Synchros, Cadiz & Canaries , Mar 17 0114 - Good level SS, presume this. 747 NETHERLANDS Radio 5, Flevoland , Mar 18 0125 - Noted here with Bob Dylan/Woodie Guthrie 'This Land' and into another 60s hit. Fair to poor. Announcer's language IDed by others as Dutch. 774 EGYPT ERTU M-East Prg., Abis (pres.) , Mar 17 0120 - General AA program. Also on Mar. 24. 783 PORTUGAL R. Nacional, Avanca , Mar 21 0038 - Seems a radio drama in Portugese. Good level. 783 SYRIA ORTAS 1, Tartus (pres.) , Mar 18 0125 - Traditional Arabic music and singing by Um Kalthoum, very famous Egyptian songstress. BSKSA is off and this programming very unlikely to come from Mauritania. EMWG shows Syria now as 24 hour. 855 SPAIN RNE1 Synchros, Murcia, et al. , Mar 17 0109 - Noted here, fair.//684. 864 EGYPT ERTU Koran Prg, Santah (pres.) , Mar 17 0124 - Presume this with Koranic chanting. 945 FRANCE France Bleu, Toulouse , Mar 18 0212 - Noted here at fair level with FF lounge singing. 1413 OMAN BBC Relay, A'Seela , Mar 24 1407 - Mistaken at first for an Aussie station. Was a long discussion of Indian cricket, World Cup, Tean India, etc. After 1430, mentions of bbc.hindi.com, etc. AIR Nagpur-1566 was not in. Distance over the Pacific and Indian oceans 13,356 miles or 21,490 km. Good level for most of the reception. May have left air or shifted pattern at 1458. Sunrise was at 1325 . Last audio heard at 1456 UTC. 1512 SAUDI ARABIA BSKSA Jeddah , Mar 22 0045 – Heard most evenings. Fair only. 1521 SAUDI ARABIA BSKSA, Duba , Mar 21 0055 -. Heard each evening fair to good. 1575 UNITED ARAB EMIRATES Radio Farda, Al-Dhabbiya , Mar 21 0130 - Noted each evening of the DXpedition. Often running Farsi pops music. The most bizarre 'hits' were a Michael Jackson number and FARSI RAP!!! Never above a fair level. 549 CHINA CNR5 Fujian (pres.) , Mar 17 1347 - Heard most mornings, dominating the Aussies late. 666 CHINA UNID CC, (Voice of Straits, pres.) , Mar 24 1120 - Presumed this due to strength and prop. 684 CHINA CNR6, Putian, FJ , Mar 17 1352 - Noted each AM //909. Excellent, post-dawn. 765 CHINA CNR5, Fujian , Mar 17 1306 - Heard every AM, excellent at dawn //549. 783 CHINA Voice of the Strait, Fujian (pres.) , Mar 18 1202 - Presume this one heard each AM. 873 CHINA Voice of Straits, Fuzhou (pres.) , Mar 24 1125 - Presume this //666. Noted several AMs. 909 CHINA CNR6, Quangzhou , Mar 17 1313 – Heard each dawn // weaker 927 CNR6 Fujian. 927 CHINA CNR6, Fujian , Mar 17 1313 - //909 CNR6 Quangzhou. 936 CHINA UNID CC probably Anhui , Mar 24 1325 - Probably Anhui Music noted here in passing. 963 CHINA CRI Russian Service , Mar 24 1135 - ID 'Govorit Pekin'. 981 CHINA CNR1, Synchros , Mar 18 1350 - Fair level with echos. 990 CHINA CNR (N) Shanghai (pres.) , Mar 18 1328 - CC with some EE ads and scattered EE words. 999 CHINA UNID CC, probably Liaoning Economic , Mar 24 1335 - Noted in passing. 1035 CHINA CNR1 Synchros , Mar 24 1330 - Fair to good level. 1044 CHINA CNR FS. Korean, Yanji , Mar 17 1327 - Heard every morning at good level. 1062 CHINA Zuijiang JGD, Guangzhou (pres.) , Mar 24 1334 - Presume this here in Cantonese. 1071 CHINA UNID CC, probably Tianjin , Mar 24 1336 - Most likely Tianjin JGD. 1089 CHINA CNR6 Fujian , Mar 17 1318 - Fem Sing //909. Fair level. Heard each AM. 1116 CHINA CNR5, Shaowu , Mar 25 1314 - Presume this one, with QRM from 4BC. Noted in passing. 1125 CHINA Hebei E., Shijiazhuang (pres.) , Mar 24 1337 - Highly likely this the one with huge signal. 1134 CHINA UNID CC probably CNR1 , Mar 24 1215 - Noted in passing at good level. 1170 CHINA UNID CCs, two mixing , Mar 24 1342 - Two mixing at fair to good level. All low power. 1179 CHINA UNID CCs, two mixing , Mar 24 1345 Most likely Mainlanders, but Taiwan here, too. 1206 CHINA CNR Korean Service , Mar 18 1232 - Excellent level!. 1278 CHINA UNID CC probably Heibei , Mar 24 1240 - Noted in passing, most likely, Hebei (N). 1305 CHINA UNID CC , Mar 24 1245 - Noted in passing. Probably CNR2. 1323 CHINA UNID CC , Mar 24 1247 - Noted in passing. 1332 CHINA UNID CC probably Fuzhou RGD , Mar 24 1250 - UNIDed noted here in passing. 1377 CHINA CNR1, Zengzhou , Mar 17 1333 - Heard every AM. 1377 CHINA UNID CC probably V of the Strait , Mar 24 1952 - Very likely Voice of the Strait, from Fujian Province. CNR1 noted beneath. 1386 CHINA UNID CC probably CNR1 , Mar 24 1350 - Standard CC noted in passing. 1395 CHINA UNID CC probably Anhui ‘Life’, Mar 24 1358 - Standard CC noted in passing. 1404 CHINA UNID CC probably Fujia EBS , Mar 17 1335 - Also heard on Mar. 24. 1422 CHINA UNID CC probably Shanghai JGD , Mar 24 1304 - Shanghai most likely of those listed. 1485 CHINA UNID CC , Mar 24 1250 - UNID CC noted in passing. 1593 CHINA CNR1. Changzhou , Mar 17 1228 - Heard each AM, sometimes well. 1593 CHINA CRI Japanese Service, Heilongjiang , Mar 17 1345 - Excellent level. Heard also Mar. 24. 1602 CHINA UNID CC , Mar 17 1346 - Only Chinese listed on 1602 is Jiangsu 1. Most likely this, since that is a coastal province. 594 JAPAN JOAK, Tokyo , Mar 18 1017 - Heard throughout DXpedition. 693 JAPAN JOAB, Tokyo , Mar 17 1058 - Heard also, Mar.18 at fair level both times. 747 JAPAN JOIB, Sapporo , Mar 24 0816 - NHK2 programming. Fair //774. 774 JAPAN JOUB, Akita , Mar 24 0816 - NHK2 programming at fair level //747. 828 JAPAN JOBB, Osaka , Mar 18 1207 - Noted // 774 at good level,. 873 JAPAN JOGB, Kumamoto , Mar 18 1210 - Heard //828. 891 JAPAN JOHK, Sendai , Mar 18 1212 - Noted at fair level //594. 954 JAPAN JOKR, Tokyo. , Mar 18 1218 - Fair only. 1017 JAPAN JOLB, Fukuoka , Mar 18 1220 - Good //828. 1134 JAPAN JOQR, Tokyo , Mar 18 1228 - JJ literary discussion. Fair only. 1242 JAPAN JOLF, Tokyo , Mar 18 1235 - Heard poorly by language only in furball. 1260 JAPAN JOIR, Sendai , Mar 24 1347 - Bubble gum programming. Probably All Night Nippon. 1314 JAPAN JOUF, Osaka , Mar 25 1340 - Bubble gum music/infotainment. Presume ANN program. 1413 JAPAN JOIF, Fukuoka , Mar 24 1401 - Pop music and JJ talk at fair level. 1422 JAPAN JORF, Yokohama , Mar 17 0919 - Fair to good with phone-in show. Heard also on Mar.18. 1440 JAPAN JOWF, Sapporo , Mar 24 1357 - Noted here with commercial string and net ID. Good level. 1602 JAPAN NHK2 Synchros , Mar 24 1257 - Noted in passing at fair strength. 657 NORTH KOREA Pyongyang BS, Kangnam , Mar 24 1403 - News in Korean, dominating 2YC. 972 SOUTH KOREA HLCA, Dangjin , Mar 18 1115 - Heard also on Mar. 25 at fair level. 1143 TAIWAN UNID CC, probably BEL3, Taiwan , Mar 24 1341 - Almost certainly, this was the 100 kW Taiwanese here. Heard only in passing. 1170 PHILIPPINES IBB/VOA Relay, Poro (pres.) , Mar 25 1335 - Presume this the one at excellent level. No ID, but rap music and general formatting of the music program leads to VOA in CC, presumed. 1458 PHILIPPINES DWRF, FEBC, Iba (pres.) , Mar 17 1541 - Christian talk in part SS, part probable Tagalog. Presume this. 1494 PHILIPPINES DYAB, Cebu City , Mar 17 1340 - Noted at excellent level with phone-in program. Typical mixture of EE and Tagalog. 1566 SOUTH KOREA HLAZ, Cheju Island , Mar 17 1340 - Noted here at fabulous level at dawn, with JJ programming. 'Nihon FEBC desu!' Heard every AM. 1566 INDIA AIR Nagpur , Mar 18 1411 - First noted in Hindi talk by woman, mixing with 3NE and HLAZ. Dominant by 1420, ID in EE at 1430, 5 minutes of EE news at 1430. Very good at times. 1575 THAILAND VOA Thailand , Mar 17 1142 - Noted each AM, sometimes at excellent level. 531 AUSTRALIA 4KZ, Innisfail , Mar 17 1146 - 60s Rock. 'This is 4KZ, Innisfail.' Fair level in mix. 540 AUSTRALIA 4QL Longreach , Mar 18 1140 - In furball with R. Rhema. Fair only. 549 AUSTRALIA 2CR, Orange , Mar 17 1235 - //738 2NR Grafton. C&W. Heard most AMs. 576 AUSTRALIA 2RN, Sydney , Mar 17 0847 - Heard most AMs. 585 AUSTRALIA 7RN, Hobart , Mar 24 1107 - Briefly at good level with ABC news and sports. 612 AUSTRALIA 4QR, Brisbane , Mar 17 0804 - Saturday Night Footie, parallel everyone else. Excellent level. Heard most AMs. 648 AUSTRALIA 2NU, Tamworth , Mar 17 1054 - Footie wrap-up, //1548. 657 AUSTRALIA 2BY Byrock , Mar 24 0810 - Pop music show //648 at fair level. 684 AUSTRALIA 2KP, Kempsey , Mar 17 1057 - Footie wrap-up//1548. Heard most AMs. 702 AUSTRALIA 2BL, Sydney , Mar 17 0907 - Heard every AM. 729 AUSTRALIA 5RN, Adelaide , Mar 17 1254 - Initially, I was certain that this was AIR Guwahati in East Bengal. The programming was Sub-Continental flute music. Further, the programming continued right through the TOH with no break, time pips, etc. Since India is one of the few spots on the planet that has local time synched to the UTC half-hour, I 'knew it had to be' AIR Guwahati, which was just at transmitter sunset. What I forgot about was that South Australia is one of the other 'on the half-hour' spots on the planet. Sure enough, 5RN was running a world music show, featuring Sub-Continental Music! Heard also on March 18. 738 AUSTRALIA 2NR Grafton , Mar 17 1058 - Footie wrap-up//1548. Heard also Mar.18. 747 AUSTRALIA 4QS, Toowoomba , Mar 17 1059 - Footie wrap-up. Heard most AMs. 792 AUSTRALIA 4RN Brisbane , Mar 18 1053 - Mixing with NZ's 4ZA. Heard also on Mar. 25. 828 AUSTRALIA 3GI, Sale , Mar 17 1102 - ABC News, //1548.Heard also Mar.24. 837 AUSTRALIA 4RK, Rockhampton , Mar 17 0830 - Heard most AMs at good level. 846 AUSTRALIA 2RN Canberra , Mar 17 1104 - Heard well most AMs. 864 AUSTRALIA 4GR, Toowoomba , Mar 18 1057 - Heard mixing with NewsTalk ZB Invercargil. 873 AUSTRALIA 2GB, Sydney , Mar 17 1306 - News at good level, despite QRM from two others. 891 AUSTRALIA 4TAB, Townsville , Mar 17 1202 - Heard several AMs. 927 AUSTRALIA 4CC, Gladstone , Mar 25 0830 - 'Grafton, 4-double-C' ID. Good level. 1116 AUSTRALIA 4BC, Brisbane , Mar 17 1120 - 'The Nation's #1 NewsTalk, 4BC.' Fair at best. Heard poorly Mar. 25. Given the prominence of this signal in NW of USA and its poor showing here, would suspect that it is directional to the north, whether intended or not. 1224 AUSTRALIA 2RPH, Sydney , Mar 18 1440 - Discussion of Aussie forces in Iraq. 1233 AUSTRALIA 2NC, Newcastle , Mar 17 1212 - //702 at good level. Heard also on Mar.18. 1287 AUSTRALIA 2TM, Tamworth (pres.) , Mar 17 1125 - Only Aussie on 1287. Also noted Mar.18. 1431 AUSTRALIA 2RN Wollongon , Mar 18 1405 - Program on National Ballet of Australia. Fair. 1512 AUSTRALIA 2RN Newcastle , Mar 18 1405 - 'Radio National' Heard also on Mar.25. 1548 AUSTRALIA 4QD, Emerald , Mar 17 0758 - Saturday Night Footie //612, 837, etc. Excellent. Heard each AM of the DXpedition. 1566 AUSTRALIA 3NE Wangaratta , Mar 18 1410 - Heard with usual pops program, mixing with AIR Nagpur and HLAZ, FEBC. 531 NEW ZEALAND More FM, Alexandra , Mar 25 1340 - 'More Music, More... , More Choice'. 567 NEW ZEALAND National Radio, Wellington , Mar 17 0753 - Huge signal each night. 594 NEW ZEALAND R.Rhema Synchros, Timaru & Wanagnui , Mar 17 0850 - Heard most AMs. 612 NEW ZEALAND Radio Rhema, Christchurch , Mar 18 1022 - Noted //594, mixing with Aussie. 621 NEW ZEALAND R. Rhema Synchros, Dunedin & Whangarei , Mar 17 1349 - Noted here with alcoholism-awareness program. 648 NEW ZEALAND R.Rhema, Gisbourne , Mar 17 0855 - Heard most AMs. 657 NEW ZEALAND Southern Star, Wellington , Mar 18 1030 - Heard also Mar. 24. Excellent. 675 NEW ZEALAND National Radio, Christchurch , Mar 18 1035 - Fair, with political discussions. 693 NEW ZEALAND Radio Sport, Dunedin , Mar 18 1038 - Sports discussion, NZ websites..
711 NEW ZEALAND 2XP Trackside/R.Pacific, Wellington , Mar 18 1325 - Fair in furball. 720 NEW ZEALAND National Radio, Invercargill , Mar 18 1325 - Good at times. Furball. 738 NEW ZEALAND Radio Live, Christchurch , Mar 18 1330 - NZ ads & TC. Talk format. Fair. 783 NEW ZEALAND Samoan Capitol Radio, Wellington , Mar 17 0720 - This or Access Radio noted every night of the DXpedition, sometimes at excellent level. 792 NEW ZEALAND Radio Sport, Hamilton , Mar 18 1053 - Heard mixing with 4RN, Brisbane. 810 NEW ZEALAND National Radio, Dunedin , Mar 18 1340 - //819 Maori singing and discussion. 819 NEW ZEALAND National Radio, Tauranga , Mar 18 1340 - //819 Maori singing and discussion. 837 NEW ZEALAND National Radio Synchros , Mar 24 0822 - Classical music //918, mixing w/4RK. 864 NEW ZEALAND 4ZA, NewsTalk ZB, Invercargill , Mar 18 1057 - Heard mixing with 4GR in OZ. Only two DUs on frequency. 882 NEW ZEALAND Southern Star, Auckland , Mar 18 1348 - quiet music //900 SS Dunedin. 900 NEW ZEALAND 4YC, Southern Star, Dunedin , Mar 17 1307 - 'Southern Star' by male announcer. 918 NEW ZEALAND National Radio Synchros, , Mar 17 0820 - Heard most AMs //567. 945 NEW ZEALAND NewsTalk ZB, Gisbourne , Mar 17 0721 - Heard each AM, sometimes quite well. 972 NEW ZEALAND Radio Rhema, Wellington (pres.) , Mar 18 1106 - Presume this with Christian talk by male. HLCA beginning to dominate. 1026 NEW ZEALAND NewsTalk ZB Synchros , Mar 18 1222 - //135 Wellington at fair level. 1035 NEW ZEALAND NewsTalk ZB, Wellington , Mar 17 0735 - //945. Heard Also on Mar.25. 1044 NEW ZEALAND NewsTalk ZB, Dunedin , Mar 17 0738 - //945. Heard also on Mar.25. 1080 NEW ZEALAND NewsTalk ZB, Auckland , Mar 17 1331 - Heard after fade-out of the stations in the Americas. Good. 1125 NEW ZEALAND Radio Sport, Napier-Hastings , Mar 17 0740 - Heard several AMs. 1152 NEW ZEALAND NewsTalk ZB, Timaru , Mar 17 0742 - //945, 1035, etc. 1215 NEW ZEALAND NewsTalk ZB, Kaihoke , Mar 18 1120 - //1035, etc. 1278 NEW ZEALAND NewsTalk ZB, Napier-Hastings , Mar 17 0740 - //945, 1035, etc. 1296 NEW ZEALAND NewsTalk ZB, Hamilton , Mar 17 0750 - //945, 1035, etc. Heard several AMs. 1314 NEW ZEALAND National Radio, Gisbourne , Mar 17 0753 - //567 at good level. 1386 NEW ZEALAND R.Tarana, Auckland (pres.) , Mar 17 1135 - Usual Hindi programming. Good. 1485 NEW ZEALAND R.Trackside, Gisbourne (pres.) , Mar 17 1136 - Call of horse race at good level. 1494 NEW ZEALAND Southern Star, Hamilton , Mar 17 0755 - EZL Christian music. 738 TAHITI RFO/R. Tahiti, Mahina , Mar 17 0715 - Noted with only fair signal with Polynesian pops. 1017 TONGA A3Z, R. Tonga (t) , Mar 17 0731 - Poor level with definite Polynesian talk. 570 USA WTBN, Pinellas Park, FL , Mar 25 0200 - Heard double ID for WTBN 570 and WTWD-910, Plant City and the Radio Reloj CW 'R'. 570 USA KLAC, Los Angeles, CA , Mar 22 0240 - Multiple ads and station promos. 640 USA KFI, Los Angeles , Mar 17 1157 - 'Southern California's KFI.' Heard also Mar. 25. 660 USA WFAN, New York, NY , Mar 25 0248 - Mentions of 'WFAN.com' and local commercial string. 670 USA WSCR, Chicago , Mar 24 0140 - Chicago Blackhawks Hockey at good level. 680 USA WPTF, Raliegh, NC , Mar 24 1429 - Neil Bortz Show. 'WPTF, Raliegh'. 700 USA KALL, N. Salt Lake City, UT , Mar 24 1205 - 'Sports 700, The Dome.'. 720 USA WGN, Chicago , Mar 17 0445 - Local news and weather. 'News/Talk 720, WGN!'. 740 USA KTRH, Houston, TX , Mar 18 0230 - 'News Radio 740, KTRH.' Heard most early evenings. 740 USA KCBS, San Francisco, CA , Mar 17 0925 - 'All News, KCBS' Heard most AMs. 770 USA KKOB, Albuquerque, NM , Mar 17 1020 - 'The Talk Monster, KKOB, Albuquerque!'. 780 USA WBBM, Chicago , Mar 24 0154 - 'WBBM News Time is 8:54'. 810 USA KGO, San Francisco, CA , Mar 17 0930 - Heard every AM. 830 USA WCCO, Minneapolis, MN , Mar 25 0252 - Poor but positive, with forrest promo, etc. 850 USA KOA, Denver , Mar 17 0256 - Usual Talk format. Heard nightly and well. 880 USA KRVN, Lexington, NE , Mar 17 0259 - Heard most evenings. Good level. 1000 USA KOMO, Seattle, WA , Mar 17 0911 - 'KOMO 1000 News.' Heard most AMs. 1020 USA KCKN, Roswell, NM , Mar 17 1205 - 'Kickin' Country, KCKN.’ Heard also Mar.22, 25. 1040 USA WHO, Des Moines, IA , Mar 18 0320 - 'News Radio 1040, WHO' Heard every AM. 1070 USA KNX, Los Angeles, CA , Mar 17 0916 - 'KNX Traffic and Weather.' Heard most AMs. 1100 USA WTAM, Cleveland, OH , Mar 25 0150 - Mention of 'WTAM.com,' and Cleveland. Good. 1110 USA WBT, Charlotte, NC , Mar 24 0202 - 'WBT News' after TOH. Good briefly. 1140 USA KHTK, Sacremento , Mar 17 0535 - 'Sports Radio 1140, KHTK'. 1120 USA KMOX, St. Louis, MO , Mar 18 0327 - 'NewsTalk 1120, KMOX' Excellent level. 1130 USA WBBR, New York , Mar 24 0205 - Manhattan traffic reports and weather. 1160 USA KSL, Salt Lake City, UT , Mar 18 0328 - 'KSL Radio' Heard throughout the DXpedition. 1180 USA Radio Marti, Marathon, FL , Mar 18 0331 - 'Radio Marti.’, Miami.' Heard often. 1200 USA WOAI, San Antinio, TX , Mar 17 0458 - 'News Radio WOAI' Talk show format, good level. 1520 USA KVTA, Oxnard, CA , Mar 24 0856 - Coast-to-Coast program, then station ID. Good. 1530 USA KFBK, Sacremento, CA , Mar 17 0700 - 'NewsTalk 1530, KFBK.' Heard every night at truly local levels. 1540 USA KMPC, Los Angeles, CA , Mar 17 0705 - Also noted at good level on Mar.24. 1560 USA KNZR, Bakersfield, CA , Mar 24 0900 - Local commercials 'only on 1560, KNZR.'. 1590 USA KKZZ, Santa Barbara, CA , Mar 24 0905 - '1590, The Connection, KKZZ, Santa Barbara'. 1650 USA WCNZ, Cedar Falls, IA , Mar 25 0210 - Presume this with a local Waterloo hockey game. 1700 USA KVNS, Brownsville, TX , Mar 17 0450 - Heard well with EZL SS pops show an many ads in EE for businesses throughout the Valley. Heard very well each evening. 530 TURKS & CAICOS R. Vision Cristiana Intl., South Caicos , Mar 22 0057 - Full ID for all three stations in EE. Heard well most evenings. 555 ST. KITTS ZIZ Radio, St. Kitts (pres.) , Mar 18 0130 - Het here and threshold audio heard nightly, just at sunset. Presume this. 570 CUBA CMDC, R. Reloj, Santa Clara , Mar 25 0200 - Heard the CW 'R' clearly on the WTBN station ID and once or twice previously. 690 MEXICO XE?? ?, Tijuana , Mar 17 0232 - This Mexican station dominated 690 early each evening, and often through the night. At least part of the time, it was IDing as part of the Cadena W network of XEW, Mexico City. 800 NETHERLANDS ANTILLES TWR, Bonaire, Mar 17 0240 - Heard well throughout the DXpedition, usually in SS with numerous SS IDs. 895 NEVIS Voice of Nevis, Nevis (pres.) , Mar 17 0130 - Presume this heard every evening just after sundown with either a het or threshold audio. 1090 MEXICO XEPRS, Rosarito , Mar 17 0430 - 'Double-X Sports Radio' Dominant on this channel. 1220 MEXICO XEB, Mexico City , Mar 17 0626 - 'La Grande B.' Good level. Heard also on Mar 18. 1410 MEXICO XECF, Los Moches , Mar 24 0850 - 'La Mexicana.... Tropicaliente... Mas Grande catorce-diez de AM' Briefly quite good. May have actually been on 1413 kHz. 1570 MEXICO XERF, La Poderosa, Villa Acuna , Mar 17 0445 - This powerhouse heard each evening with great signal and usual music shows. 1620 VIRGIN ISLANDS WDHP, St. Croix , Mar 25 0205 - Noted here at good level with rebroadcast of NOAA sea-state and weather predictions. 590 ARGENTINA LS4, R. Continental, Capitol Federal , Mar 17 0308 - Multiple IDs at good level following world and national news. Heard also, Mar.21 & 22. 594 ARGENTINA LS4, R. Continental, Capitol Federal , Mar 24 0800 - Assume that this was the main transmitter, off frequency. Very strong, full Cadena ID, spot on 594.00. 700 ARGENTINA LV3, R. Cordoba, Cordoba. , Mar 16 0156 - Excellent level, Multiple very fast mentions of Cordoba and Argentina, but only one clear 'Radio Cordoba' ID. 870 ARGENTINA LRA-1, R. Nacional, Capitol Federal , Mar 17 0610 - Discussion of why LAm radio should not feature NAM and British pop music, mentions of Radio Nacional. 1610 ARGENTINA R. Guaviyu, Greg.de Laferrere (B.A.) , Mar 17 0400 - Lots of commercials, multiple mentions of B.A., multiple IDs. Fair to good level. 1650.1 ARGENTINA R. Renancer (pres. ), Quilmes Oeste , Mar 16 0125 - Presume this one, as only listing, at fair to good level with classical instrumental orchestra music. Great to hear such on AM. 1660 ARGENTINA Hosana AM(pres. ), Ezeiza , Mar 16 0130 - Seemingly Christian pops, sometimes at good level. Only listing on this freq. Presumed only. 1663.1 ARGENTINA R.Bethel (pres. ), Banfield , Mar 22 0153 - Has Bethel drifted this low???. 1667.76 ARGENTINA R. Bethel(pres. ), Banfield , Mar 16 0138 - Presume this one as is only 1670 listing and is reported to be drifting below assigned frequency. Pop music show with female host. 1280 BRAZIL R. Tupi, Rio de Janeiro , Mar 17 0023 - Multiple IDs as 'Too-Pee' and 'Radio Too-Pee' in PP. Excellent level, 60 minutes before LSS. Also heard Mar.22. 1380 CHILE CB138, R. Corporacion, Santiago , Mar 16 0107 - 'Radio Corporation' ID. Heard well throughout the DXpedition. 1569.9 CHILE CC157A, R.Familia de Maule, Talca , Mar 22 0230 - IDing as 'Radio Familia.' Fair. 540 ECUADOR HCFA2, R. Tropicana, Guayaquil , Mar 22 0100 - Lotsa commercials 'La Voz del la Romanticos'. 850 ECUADOR HCGU13, Radio San Francisco, Guayaquil , Mar 16 0050 - Full ID at TOH as 'Radio San Francisco, Guayaquil.' Excellent level. Also rather shcked with this as second Easter Island logging. Excellent level, pre-sunsert and off the side of the antenna. Heard each evening. 880 ECUADOR HCRP1, R. Catolica Nacional, Quito (pres.) , Mar 21 0210 - Presume this one with loooong discussion of families, marriage, children, sexual matters, etc. without end. Good level. Heard also Mar. 22. 1120 ECUADOR HCFV2, Estacion Intercontinental, Guayaquil , Mar 18 0028 - Caught this 5 kW. daytimer with full formal sign off at 0030. Good level. 530 FALKLAND ISLANDS FIRS, Port Stanley (tentative) , Mar 21 0250 - BBC WS feed at good level. Tentative this, as seems to fit published schedule and there are few other alternatives. 580 PERU OAX4M, R. Maria, Lima , Mar 17 1016 - This one noted with a big sig at SR at the Tx. Also noted on Mar.21, with multiple IDs. 700 PERU OBZ4H, R-700, La Grande, San Miguel , Apr 24 0300 - Noted with multiple La Grande slogans at TOH. 730 PERU OAX4G, R.Programas del Peru, Isidro , Mar 16 0045 - Very surprised this the first station logged at Easter Island, With the antenna pointing at least 45 degrees away. Excellent level 45 minutes pre sunset. Probably most heard station during DXpedition. 760 PERU OBZ4X, Radio Mar Plus, Chorillos , Mar 25 0230 - 'Radio Mar Plus..... Tropicalente' Multiple IDs, Booming in!. 820 PERU OAX4O, R. Libertad, Lima , Mar 22 0241 - Pop music with lotsa commercials and IDs. 880 PERU OBZ4N, Radio Union, Lima , Mar 25 0045 - 'Radio Union' with a talk show. Good level. 900 PERU OBX4X, R. Felicidad, Lima , Mar 17 0325 - Heard with music program and multiple IDs. 960 PERU OAX4D, R. Pan Americana, Lima , Mar 22 0102 - Musica romantica program with multiple 'Radio PanAmericana'. 990 PERU OBX4J, R.Latina/R.Victoria, Miraflores , Mar 22 0300 - Now part of 'Cadena Victoria' and IDing as Radio Victoria after a lengthy religious program. 1400 PERU OBX4W, R. Callao Super, Lima (t) , Mar 17 0035 - Brief fade-up with Lima clearly mentioned several times, but no ID. Tentative this. 1470 PERU OAU4B, CPN Radio, Lima (pres.) , Mar 22 0040 - Mentions of Lima. Heard also on Mar 25. 1499.9 PERU OBX4I, R. Santa Rosa, Lima , Mar 16 0122 - What a mess on 1500 kHz! signals in audio on 1500.27 and this one on 1499.9, with some station actually on frequency, but weaker on 1500.00. The Eton E1 really shined. Logged a pop music show with a male host on this 1499.9 at good level. Full ID as 'Radio Santa Rosa, Lima' at 0125. The audio on 1500.27 was fairly weak and I moved on to the expanded band, hunting Argentines. Radio Santa Rosa heard each evening. 21 stations in 13 countries: Spain (7), Egypt (2), Saudi Arabia (2), Algeria, Eire(p), Bosnia(p), Morocco, Netherlands, Portugal, Syria, France, Oman and UAE. 68 stations in 8 countries: China (40), Japan (18), Philippines (3), South Korea (3), North Korea, Taiwan(t), India and Thailand.